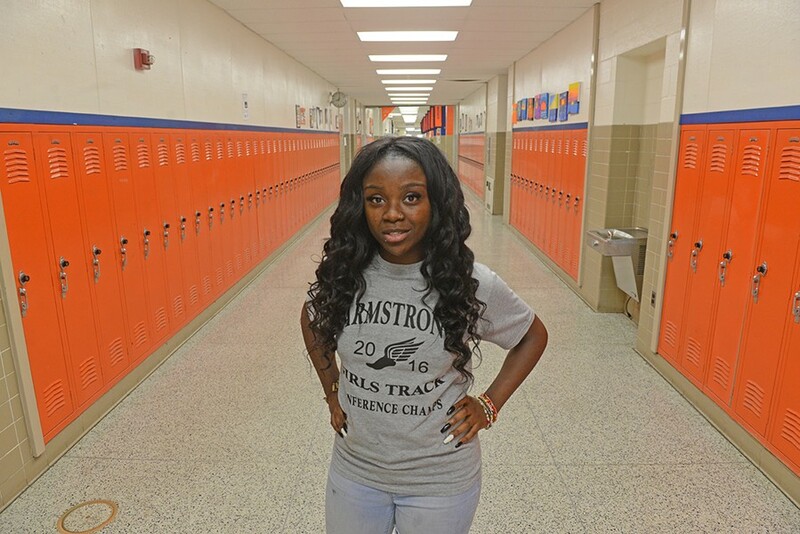 Interview: An Armstrong High School Senior Discusses Her Time in the Richmond Public Schools | News and Features | Style Weekly - Richmond, VA local news, arts, and events. Eighteen-year-old Fatiyah Boone Neville is one of 1,109 seniors who will graduate from Richmond Public Schools this week. She'll attend Old Dominion University in the fall. are wrapping up their time in the Richmond Public Schools and preparing to head off into the world of paychecks and higher education. Eighteen-year-old Fatiyah Boone Neville joins her Armstrong High School classmates at Altria Theater on Wednesday to receive her diploma. Style sat down with her, next to a painting she’d done for her high school counselor, to talk about her next step. Style: Congratulations! Have you looked back at your high school experience at all? At Armstrong I was lost, like, I didn’t have any friends. I was eating by myself. It was just a work in progress. Now I have my group of friends. Did you grow up in Richmond? I was born in Mecklenburg County, Va., then I moved to New Jersey. But the lifestyle there was bad, and we moved here when I was 5 or 6.
to Franklin Military Academy for middle school. I didn’t think [Franklin] was for me. You’re in Advanced Placement Art Studio. What sort of art do you do? It’s about African-American society. I draw women — I don’t know why but I’m just more interested in female subjects. I sketch it out first, and I do oil paints or acrylics, and pastels, too. When I was at Franklin, I was drawing stuff. But I didn’t know my talent until I got here to Armstrong. I was in Art 1, and it wasn’t that interesting. It was just drawing lines and horizons, but they skipped me to Art 5, because they saw the talent I had. Then it was like, "I can draw anything I want to." I’ve gotten better since the first time I did something in that class. I never thought I’d be drawing portraits of people, but I just got more interested in it. judged, and I get my results back in July to see if I can take courses in college. Who’s the most interesting person you’ve drawn? I drew a picture of my grandpa and grandma. I think that’s the most interesting thing I ever did. It was hard. I learned a lot about them. Besides Ms. Shaker, are there other teachers that have helped or inspired you? Mr. Koshock is the head of the art department. He was my Art 1 teacher. When I was bored with it, he said, "You gotta get through this level to get to the next level." I give up on my stuff sometimes. But he always said, "You can’t see the picture till it’s done." It’s always going to be ugly before it gets pretty or beautiful. He’s said, "Take your time, be patient." Through my high school years, I learned to be more patient. It takes time — a lot of time. What’s the hardest thing about high school? Being in this school and its surrounding communities, sometimes it can be very hectic. It’s like everybody has a different personality. Everybody’s been through things. Everybody has that anger issue, that anger problem. So different personalities bump heads all the time. But you really won’t know a person until you meet the person. You can’t judge a book by its cover. You’ve really got to sit down and get to know that person. Is there someone like that for you? My best friend. We used to bump heads all the time. We couldn’t stand each other. But we came to find out that we both like some of the same things. We’ve both got goals and high expectations of ourselves. We’re inspired by our families. His mom and dad died. But I get energy and motivation from him, and he gets motivation from me. I want to be like him, and he wants to be like me. So we feed off of each other. He’s going to Virginia State University for agriculture and he wants to be a veterinarian. He takes vet classes at the technical center. And I take medical terminology. I’m going to Old Dominion University, majoring in biology on a premed track, and minoring in art. but I’m used to a predominantly white society. You want to be a doctor? I want to be a cardiovascular surgeon. My family on my grandfather’s side has a history of heart problems. My grandfather needs to take his blood pressure every morning. It’s a drive for me to help people, since I was 5 years old. I always knew I wanted to be a doctor. I want to start a program for low-income families that can’t afford treatment for heart failure or new hearts. Do you have your eye on a particular medical school? Are you going to miss Richmond? I’ll be homesick, yeah, because when I went to Long Island for a week, I was homesick. I was very torn up. Part of me thought, I don’t want to do go to school that far away, because I’m going to miss the good meals at home. And it’s going to be a lot of responsibility, I know. Mostly likely, I’ll be working. ODU gave me enough money for a full ride, plus I got an Altria scholarship, so I’ll have money left over. But I still want to save money. I’ll do work-study in college, so I can save money for medical school, because I know that’s going to be expensive. Do people ever say, "You’ll understand when you’re older?" My grandfather likes to say it’s all going to pay off when I get older. I’ll always remember that. He had a hard life, but he worked really hard. He built a foundation for us. He got a house that’s almost paid off. He has a job, two cars. It’s all paid off, and he’s a living testimony. Nobody listened to him, but he worked hard, used his manners. He always says, "It doesn’t matter what you want to be in life. As long as you’re the best at it." I’ll be a first-generation college graduate. It’s all going to pay off when I get older.